THAT'S AMORE! 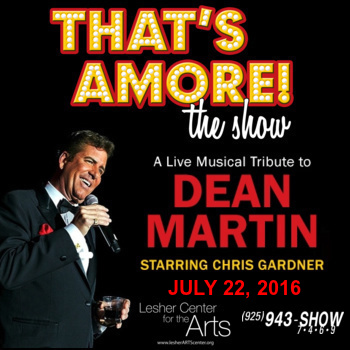 is a live musical tribute to Dean Martin starring Chris Gardner. The World Premiere Musical Event will feature a full 16 piece orchestra and special guests. Popular songs performed are Ain't That A Kick in the Head, Volare, Everybody Loves Somebody, Sway, That's Amore and many more!